A Firstpost article recently stated that Kangana Ranaut may be the next female “Khan” of Bollywood. They suggested that she can deliver hits by her sheer presence as do the aging male Khans (Saif, Shah Rukh, Salman) who get paid grossly more than their female counterparts. To be clear — Kangana is incomparable. The sequel to the 2011 hit film already has cash registers ringing and critics singing. I believe its success lies in the sheer hunger of the audience to see Kangana recreate her magic on-screen post Queen. The trailer gave us a glimpse of the multiple treats of great acting, writing, and music combined and for this, we must acknowledge the efforts of entire movie team, from the writer to the smaller actors who played their parts to perfection. Even then, it is Kangana’s double role as a Haryavani athlete pitted against a feisty Tanu that makes this film out of this world. The first half is wildly entertaining. Dialogues are superb and each character nails their scenes. Kangana is so convincing as Datto that when I showed my mom the first trailer, she was surprised to know that it was the same actress! This is why we go to the cinema hall. To be in awe of the sheer brilliance unfolding before our eyes. Deepak Dobriyal is especially excellent and Tanu’s raw energy almost transcends from the screen into our skin. When Kangana emotes, it is just the right dosage to make the audience cry, laugh, and dance with her. I went to see a late night show of TWMR on its first day of release and the best part was the audience clapping and laughing along throughout the movie. It was as if I was sharing an experience with a big family. The last time I experienced such a response was when I saw Queen and 3 Idiots. TWMR portrayed reality with such finesse that everyone could relate to something. Tanu’s life in London dulled her marriage and she reclaimed her mojo by meeting her old flames and living her life freely upon her return to Kanpur, much to the dismay of her family. The second half is more dramatic as new tensions start unfolding and Tanu has tamed herself to a more sober state when she realizes that Manu has chosen a new woman, who resembles her in appearance. Gradually, we get to know that Tanu never intended to divorce Manu. Realizing that her man has moved on (owing to differences created by Chintu), she tries to mend her ways and be supportive towards his decision to remarry. Of course, like any movie, it is not without flaws. The entire casts acts wonderfully but the story falters in moments when the audience may expect an outcome and something different happens. For example, I did not expect the fearless Raja to back off when Chintu threatens him with a lawsuit for harassing him. Or the rather harmless Pappi kidnapping an unwilling Komal. Or that a Punjabi Tanu starts dancing in Haryavani “Ghani Bawri” near the climax. Or the ending that just ends so abruptly. Bollywood has witnessed tremendous female performances in the past. Sridevi enacting Charlie Chaplin in Mr. India, and Hema Malini’s double role in Seeta aur Geeta are iconic in their own way. Tabu is another such powerhouse performer. In recent decades, however, Bollywood has became benevolent to many new entrants, mainly star kids, models, and beauty pageant folks who are given opportunities in mainstream movies for sheer eye-candy. Some have managed to improve their acting abilities after a slew of movies (Deepika, Priyanka) and some never do. Those with genuine acting and theater experience such as Richa Chaddha, Sanjay Mishra, or Konkona Sen Sharma get positioned in off-beat flicks. Though, we have seen some progress with the likes of Nawazuddin Sidiqqi and Rajkumar Rao who are offered roles in movies with bigger budgets. Kangana is one such actor who combined her commercial viability with terrific art-house talent. She was a strong performer since the day of her debut. Her honest and level-headed approach to work and her ethics to refuse item songs and endorsement of fairness products make her a true role model. Moreover, you see nothing but overwhelmingly positive comments about her, whether it be on Youtube, Twitter, or any number of online posts. This kind of genuine outburst sets a precedent of sorts. As the ever evolving audience, we will keep craving quality cinema. Sadly, our needs are seldom met. Perhaps 2 or 3 movies a year really make the cut. But the tides are changing with more women taking lead roles. Vidya Balan was a proponent of that movement with the Box office success of Kahaani in 2012. Now Kangana has established herself as an artist that manages to do the impossible – consistently deliver movies with critical acclaim and commercial success. And with more content driven cinema coming her way, I’m sure she will prove her mettle on more occasions. Bollywood was in a long drought for an actor like Kangana. All the more power to her! Note: This Review was originally published on Sakshi's blog. 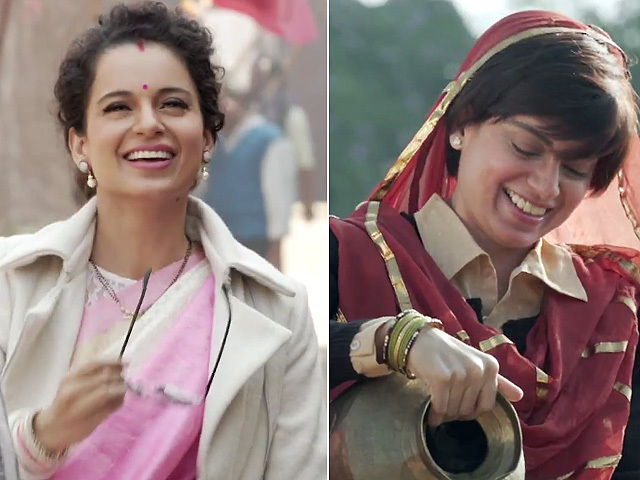 I feel so happy to see Kangana finally getting her due. Have always loved her. As for the film, I am going to see it again, just for her, rather just for her & her.